ENSENADA, Baja California, Mexico — Mexico’s veteran champion racer Gustavo Vildosola Sr has drawn the first starting position for the SCORE TT Legend class that starts along with the marquee SCORE Trophy Truck division for next week’s special format Lucerna Hotels & Resorts Tijuana 22nd SCORE Desert Challenge. Round 3 of the four-race 2018 SCORE World Desert Championship will be held next Saturday and Sunday (Sept. 22-23) with pre-race festivities in Tijuana’s Zona Rio area next Thursday and Friday (Sept. 20-21). Moving to the largest city on the Baja California peninsula last year, this race will again utilize a special split format two-day event with two laps each day over a 33.7-mile loop course (134.8 total race miles) as the Lucerna Hotels & Resorts Tijuana 22nd SCORE Desert Challenge. Considered legendary among the SCORE faithful followers in Baja, Vildosola, 65, is a successful businessman from Mexicali who is CEO, founder and owner of the prominent Mexicana Logistics trucking company. In his long career in SCORE racing, he has three career SCORE Trophy Truck race wins as well as three more in the new SCORE TT Legend class for drivers 50 years and older. He also won the SCORE Class 5-1600 season point championship in 1995. Starting with last year’s SCORE TT Legend class win in the BFGoodrich Tires 50th SCORE Baja 1000, Vildosola Sr is teaming with USA’s Scott Bailey, 58, of Riverside, Calif. The pair also won this year’s BFGoodrich Tires 50th SCORE Baja 500 as well and finished second in class in the season-opening SCORE San Felipe 250 in April. The pair drives the No.12L Chevy Silverado built by ID Designs. Vildosola Sr made racing history in 2010 when he and his son Gustavo ‘Tavo’ Vildosola became the first Mexican nationals to win the overall title in the SCORE Baja 1000, winning in a peninsula run from Ensenada to La Paz. Vildosola Sr/S. Bailey will lead a field of 14 starters off the line in the marquee SCORE Trophy Truck division for high-tech, 950-horsepower unlimited custom trucks. The field includes two trucks in the SCORE TT Legend. Among the other racers who drew first starts along with the number of entries to date in their respective classes are: Trophy Truck Spec – No. 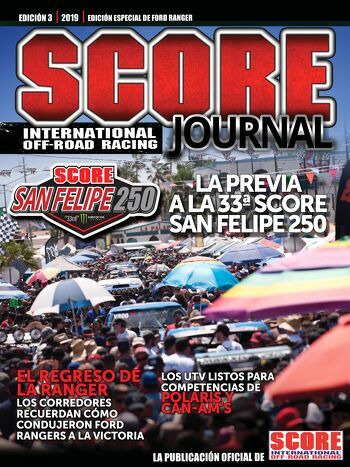 276 Gerardo Iribe, Miami, Fla. (Rosarito Beach, Mexico), Curry/ISRT-Chevy 1500, (14 entries to date); Pro UTV FI – No. 2971 Wayne Matlock, Alpine, Calif., Polaris RZR XP4 Turbo (race-high 18 entries); Class 1 – No. 129 Brandon Bailey, Riverside, Calif., Alumi Craft-Chevy (six entries); Class 10 – No. 1062 J.J. Schnarr, Reno, Nev., Alumi Craft-Chevy (14 entries); SCORE Lites – No. 1258 Jeremy Davis, Chino Hills, Calif., Porter-VW (seven entries) and Pro UTV NA – No. 1985 Adrian Arellano, Jamul, Calif., Polaris RZR XP1000 (six entries). Leading the motorcycles onto the course will be the No. 1x of Shane Esposito, Temecula, Calif., Honda CRF450X (nine entries) in the Pro Moto Unlimited Class. Starting first in the Sportsman Moto class will be the No. 200x of Miguel Pena, Tijuana, Mexico, KTM 450EXC (10 entries). Pre-running on the official race course, exclusively for all car, truck and UTV classes is being held today and Saturday and pre-running exclusively for motorcycle and quad classes will be held on Sunday. There will be no pre-running on the race course allowed on next Monday through Friday (Sept. 17-21). With 152 official entries to date, there are racers from 22 U.S. States and eight countries. Nations are USA, host country Mexico, Austria, Canada, Germany, Italy, New Zealand and Peru. States with racers so far are Alaska, Arizona, Arkansas, California, Colorado, Connecticut, Florida, Idaho, Kansas, Louisiana, Missouri, Nevada, New Jersey, New Mexico, New York, Oklahoma, Oregon, South Dakota, Texas, Utah, Virginia and Wyoming. Starting and finishing adjacent to Rancho Casian in Southeast Tijuana, the partially new race route travels in a counterclockwise direction. The revised 33.7 tough terrain miles were designed and put together by SCORE Race Director Jose A. Grijalva. It covers much of the land used in last year’s 23.4-mile loop, especially from Rancho San Vicente (where the race started last year), considered the roughest section of the course. The elapsed-time race with a two-hour-fifty minute time limit each day for Groups 1 and 2 and 2:20 for Group 3 will start at 6:30 a.m. PT each day. Group 1 will have motorcycle and quad classes, Group 2 will have the bulk for the car and truck and all UTV classes and will start their two-lap run at 11 a.m. PT each day..
Group 3 with the marquee SCORE Trophy Truck and SCORE TT Legend divisions along with the Unlimited Class 1, Trophy Truck Spec and Hammer Trucks will run the first half of their race (two laps) on Saturday afternoon (Sept. 22) and final half (two laps) on Sunday afternoon (Sept. 23). Racing for Group 3 featuring the SCORE Trophy Trucks will start each day at 3:30 p.m. PT and racing will finish each day at approximately 6 p.m. Celebrating its 25th year as the featured SCORE racing division for high-tech, 950 horsepower unlimited trucks, SCORE Trophy Trucks, the post-race awards celebration will be held in the start/finish line area at Rancho Casian on Sunday (Sept. 23), at 5:30 p.m. PT for Group 1 and Group 2 and at 7:30 p.m. PT. “SCORE welcomes spectators to go to all of its races but consistently encourages safety and caution”, said Juan Tintos Funcke, SCORE Advisor. “The colorful Contigency day and Manufacturer’s Midway from 9:00 am to 6:00 pm on Friday (Sept. 21) in front of Hotel Lucerna on Avenida Paseo de los Herores in the Zona Rio area of Tijuana, will provide a great pre-race family atmosphere to see the incredible desert racing cars, trucks, UTVs, motorcycle and quads and meet many of the famous racers”. Tintos added that there will be several access points to the race course all of which will have Police presence including the Start/Finish line at Rancho Casian. There will be parking, food vendors and restrooms at that area.